By enjoying this swinging game, you will feel an extraordinary sensation, floating in the air as if flying freely like a bird that flies and makes your adrenaline beat very fast. Those who like challenges and nature tourism, of course the activities offered by Bali Swing are something special. . . But for those of you who are high phobias and have heart problems, this game is certainly not recommended. if you can control the game well, you will be able to enjoy incredible views and be able to relax to see the surrounding nature that looks beautiful and charming. 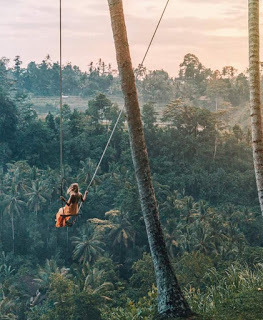 The view of the Ayung River valley with tropical trees and coconut trees, and stunning cliffs will look very beautiful when you swing at an altitude, moments like this you will definitely not forget, especially by taking pictures in the form of selfies or videos that are not will be forgotten during a vacation in Bali.